Chemical Constituents and Components : Main chemical constitutents are alkaloids, harmine, harmaline, harmalol, peganine, tetrahydroharmine, telepathine, banisterine, beta-Carboline, serotonine, vasicine, vasicinon and desoxy vasicinon. Harmine: 1. It inhibits phophodiesterase and increases cAMP & cGMP levels, thus reduce the level of free radicals. 2. It depresses the amplitude of the action potential and the maximum velocity of the upstroke. 3. It possesses cytotoxic and genotoxic activity, helpful to cure tumor cells. Harmaline: 1. It is a potent antinociceptive agent. 2. It shows significant vasorelaxant effect. 3. It inhibits phophodiesterase and increases cAMP & cGMP levels, thus reduce the level of free radicals. Curing Diseases : 1. 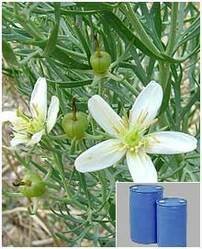 It is used in the treatment of Parkinson's disease, nervous conditions, hemorrhoids and baldness. 2. It is used in the treatment of hemorrhoids and baldness. 3. It is used in the treatment of rheumatism. 4. It is also used internally in the treatment of nervous conditions.